In the dental world, it’s the little things that keep your patients coming back cleaning after cleaning. Think of it like coming back home after college. Your mom makes your favorite foods, does your laundry, helps you with your finances, and gives you the best advice. Moms truly have a talent for knowing exactly how to get their kids to keep wanting to come home, and you can too when it comes to making your patients feel special and welcome! And while you can’t make your patients their favorite pasta dish, you can do a few other simple and thoughtful things to make them feel like a member of your dental family. Want to create relationships and an atmosphere where patients feel like they are not just a number? Try these 5 tips! Loyal patients are the lifeblood of a modern dental practice. When a new patient schedules an appointment, you have one shot at making a great first impression (pun intended)…so make it a good one! Sending a welcome letter or email before the appointment can make patients feel like they are a member of a community rather than just a customer. Plus, it’s a great vehicle to inform patients about your practice, making that first appointment far less frightening and more familiar. 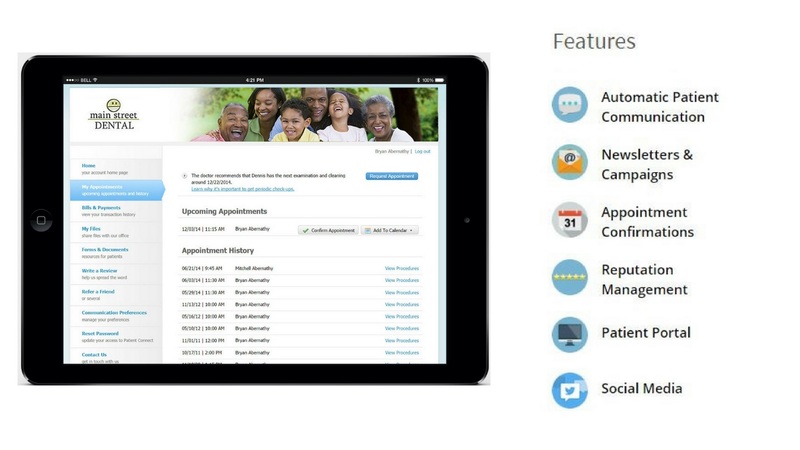 How it Works: With RevenueWell, every new patient is welcomed with an automatic email that may include a video tour of your office, a warm letter from the doctor, and all the forms & attachments they’ll need to make the first visit quick and productive. Members of a strong, tight-knit family are there for one another 100% of the time, offering a 24-7 support system. Giving your patients access to your practice around the clock allows them to have their needs addressed on their own time and on their own schedule. Whether it’s filling out a patient form, viewing transaction histories, or requesting an appointment, patients will greatly appreciate the convenient and superior service. 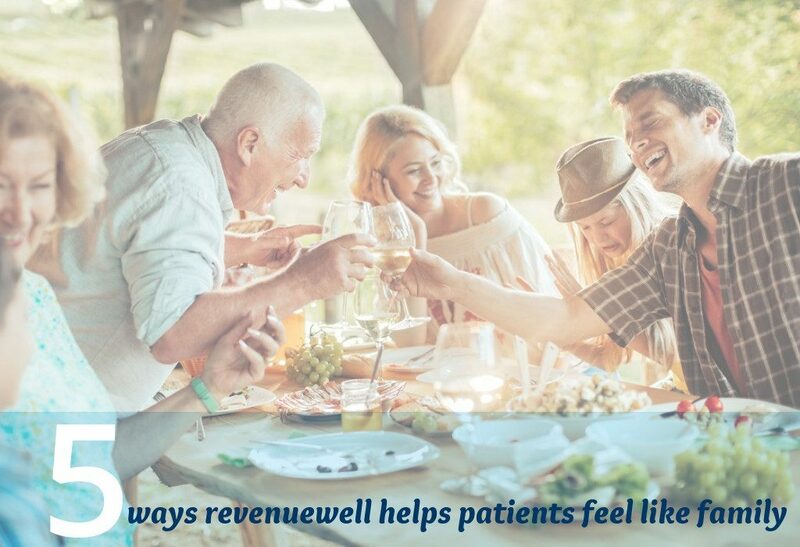 How it Works: RevenueWell allows your patients to have access to your practice any time of day using the secure Patient Connect Portal. This account management interface gives them access to everything from billing information to appointment histories to insurance records – all in one place. A greeting card can be an effective way to show someone you appreciate and care about them. Sure, you could send a stock template email wishing patients a happy birthday, but wouldn’t you agree that a card by snail mail is that much more appealing and personal? If you’re like us, you remember cards delivered via post far more than emails popping up in your crowded inbox. 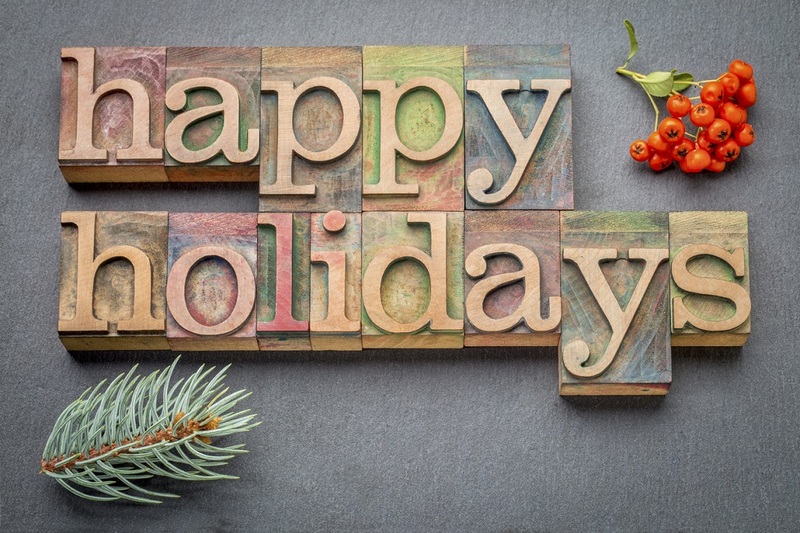 Stand out by sending a card and your patients will appreciate the effort! 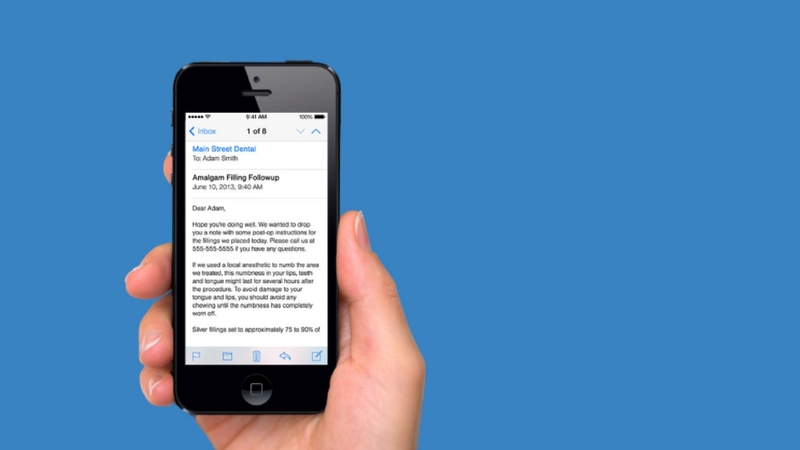 How it Works: RevenueWell sends both email and printed cards according to your settings – so you can show patients how much you care even if you don’t have their email addresses on file. If you want your patient relationships to feel anything like a family, your care should extend beyond the face-to-face time you spend at the office. Let’s say your patient had a root canal – it’s likely they might feel a bit anxious and groggy after the procedure, causing them to retain very little of your post-op instructions. To make sure your patients completely understand instructions, you can eliminate any confusion by writing down specific details for their care at home. Or, you could let RevenueWell do it for you! 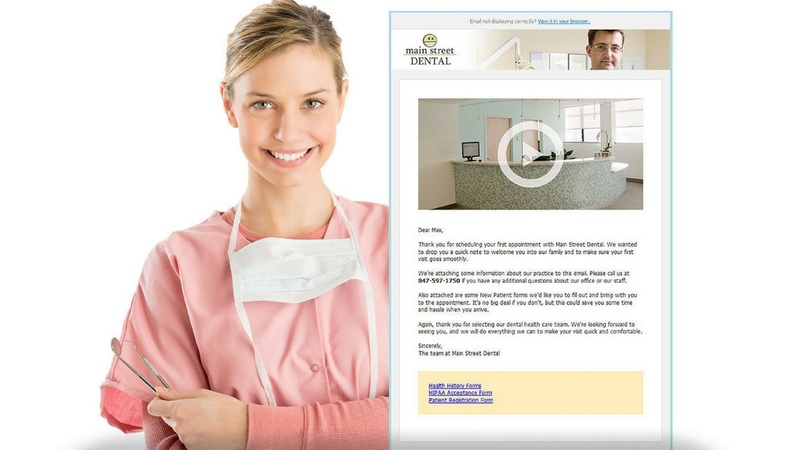 How it Works: RevenueWell automatically sends out email follow-up instructions for many common procedures like extractions, fillings, and root canals, preempting your patients’ questions and encouraging them to contact the practice if they have any additional concerns. In today’s hyper-connected and technology-based world, convenience has come to mean being accessible and interacting with your patients in the ways that they prefer. Make sure you are reaching out to them, not only to remind them of their upcoming appointment, but also other times throughout the year. Building strong relationships with your patients requires a consistent investment of time and attention. This consistency can result in more appointment requests, fewer no-shows, and a happy, loyal patient base. 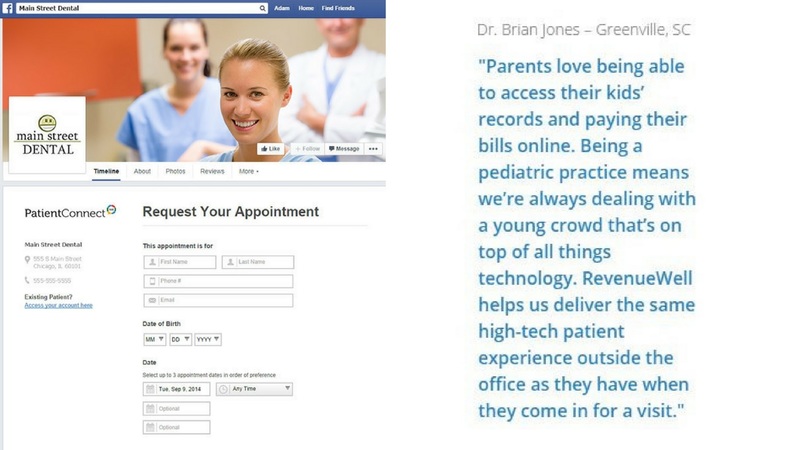 How it Works: Whether it’s requesting an appointment right from Facebook, getting a timely hygiene reminder on their smartphone, or text messaging back and forth to square away appointment details, RevenueWell makes your office a pleasure to do business with, whenever and however your patients prefer to do business. Just like the way families care for one another, dentists care about the well-being of their patients. That’s why treating your patients like family comes naturally. Anytime you interact with patients, you want to make them feel important. Create that feeling for them with these 5 tips and watch your practice blossom. As a busy dental professional, we know your time is limited. That’s where RevenueWell comes in – it can be the “glue” that holds your dental family together. 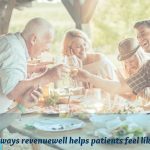 Learn more about RevenueWell and how it can help your practice HERE. To see exactly how RevenueWell works, you can request an online demo HERE. You can get signed up for RevenueWell HERE. Very helpful tips. Nowadays it is very important to keep the tight connections with your patients, and if they will feel comfortable, they will advise you to all their friends and relatives, that in your very dental clinic is the best treatment! Like this post! If you can make the time a call from the dentist welcoming NPs. This will also cut down on NP no shows/cancels. The little things always count. You’ve shared some great tips. Being friendly or making it more convenient for patients is important, but going that extra mile (like your suggestion about emailing follow-up instructions) can take patient care to the next level. I wish I could underline “care” in patient care, because what you’ve shared can tell patients that you genuinely care about them.